Alor traditional culture has been influenced over the ages by the Indian, Chinese and Javanese traders as well as by the Islamic and Christian religions. This can be seen in the silk thread woven into the original weavings and the mix of Mosques and Christian churches dotted throughout the Island. The traditional dances, Ikat weavings motifs and the varies architectural style greatly from area to area. 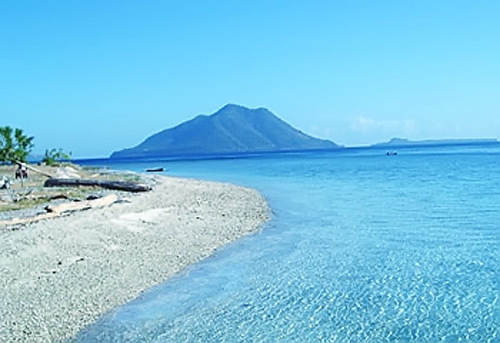 With more than a dozen traditional villages within one hours drive from the capital Kalabahi – Alor is a cultural tourists heaven. Lembata Island is known throughout the world as the home of traditional whaling but what is not known is that the people of this Island are especially rich in cultural tradition. The beautiful rich Ikat weavings are entirely made from homegrown cotton, spun and dyed by the weaver. These cloths are still important as they are exchanged during marriage for Ivory tusks between the two families. The scenery throughout the Island is breathtaking, from the ever-imposing “Ile Ape” volcano of the palm fringed bays to the colorful bustling local markets – beauty and excitement are everywhere.